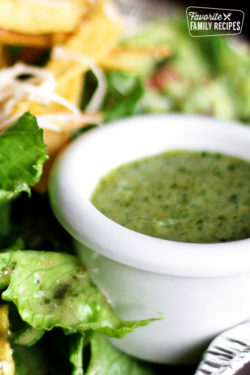 Cilantro Lime Vinaigrette is a fresh and zesty dressing for all kinds of salads. The perfect Cafe Rio and Costa Vida copycat recipe! In a food processor or blender, combine tomatillos, cilantro, garlic, jalapeño, lime juice, and sugar. After it is blended well combine with balsamic vinaigrette in an airtight container and refrigerate for at least 2 hours (overnight is best). *Make sure you use balsamic vinaigrette SALAD DRESSING, not balsamic vinegar.